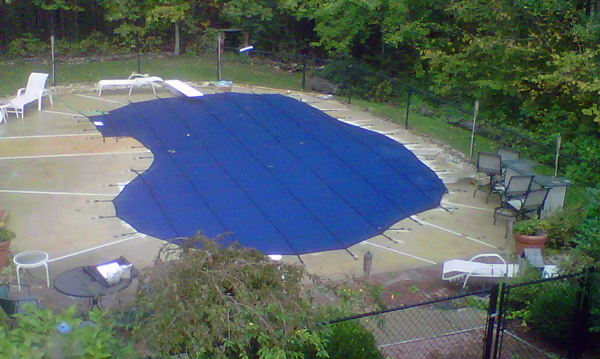 Daigle Pool Servicing Co., Inc.
We install vinyl liner in-ground pools only. This type of pool is typically about $10,000 to $15,000 less than gunite pools, yet they are just as durable. Aside from the lower cost, we believe vinyl in-ground pool systems are a better choice for the harsh New England climate. Vinyl liner in-ground pools are made from steel panels that are bolted together. No longer shaping the bottom with sand or stone dust, in-ground liner pool bottoms are constructed from a vermiculite and Portland cement mixture, which becomes very hard (yet light weight) when it is dry. At Daigle Servicing, we work with Imperial Pools, installing their “Royal” line of in-ground pools. Thick, 14-gauge steel sidewalls and 20 mil thick liners make this one of the best in-ground pools on the market today. Endless design possibilities! Many people think that to have a custom shaped pool it must be gunite, but this is not true. While there are standard shapes to choose from, the steel side panels of the Royal pools we install can be precision-bent to conform to any design specification. Vinyl liners also come in a wide range of colors and patterns. It is a good idea to consult with a landscape architect or designer to determine the proper place for your pool and how it relates to the larger landscape. Then let Daigle Pool Servicing do the rest! Our own installation crew. Pool companies are notorious for hiring a battalion of subcontractors to complete a pool project. Aside from the excavator, electrician, and pool deck installer – Daigle pools are installed by our own specially-trained crew. Your pool will be designed by the owner, Don Daigle, who also coordinates the project and oversees the installation crew. This means seamless communication throughout the installation process – and more importantly – a shorter completion time. After all, we want you swimming in your new pool – not wondering when the next phase of construction will get done! Installing an in-ground swimming pool is a big investment. If you don’t plan on using it for many years, perhaps an above ground pool would be a better choice for you. If you’re not sure, call us to schedule a free backyard consultation to discover what pool is best for your family and your lifestyle. Pool Financing options available to qualified buyers. Thank you for helping us on such short notice. We passed inspection! Katie L.
Copyright © Daigle Pool Servicing Co., Inc.